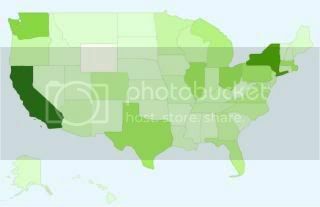 My Google Analytics data tells me that this site has had visitors from all 50 U.S. states... except Wyoming. I realize it has the lowest population of any state, but it still makes me wonder if I'm doing something wrong. Here's the thing that the government doesn't want you to know...NO ONE lives in Wyoming. Shhhhh. Even at least one person in South Carolina visited you. Come ON, Wyomingites!